See how Openbravo's warehousing capabilities can help you manage your warehouse staff, stock, and space more effectively. Effective inventory management begins with getting better visibility of what comes into your warehouse and what goes out. 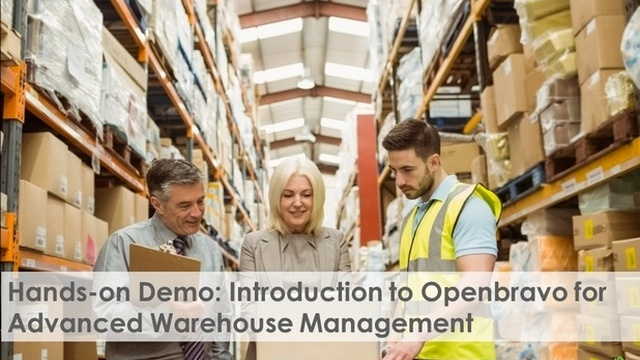 This hands-on demonstration, a follow-up to our Inventory Management `presentation, will show some of the new Advanced Warehouse Operations features in Openbravo software that help retailers optimise stock, space and staff use in warehouses. The features include cross-docking, wave picking, cycle counts, quality inspection, dynamic priorities and travel sequences. If you wish to watch the full webinar which accompanies this presentation, please visit http://www.openbravo.com/resources/webinars/?commid=263517.